MC4R is a 37 KDa G protein-coupled receptor playing a pivotal role in controlling appetite and energy homeostasis . Besides these effects, MC4R also have physiological roles in regulating cachexia, cardiovascular function, glucose and lipid homeostasis., reproduction and sexual function., ethanol abuse, pain perception., brain inflammation and anxiety. MC4R is a member of the melanocortin system, which is the main regulator of energy balance. Melanocortins ( α-, β- or γ-MSH and ACTH), which are the most important components of this system, are small peptide hormones, derived from the melanocortin precursor molecule proopiomelanocortin (POMC). These molecules are able to bind with different affinities to 5 distinct melanocortin receptors (MCRs), which belong to the super family of G protein-coupled receptors (GPCRs). MC4R is widely expressed in the central nervous system. This receptor binds preferentially ACTH and α-MSH, with similar affinity, and activates identical signal transduction pathways. Both α-MSH and ACTH are present in the hypothalamus, but the exact amounts and thus their relative quantities are difficult to determine and are a matter of debate. However, endogenous α-MSH thus far is believed to be the major physiological agonist and to act in an anorexigenic manner. The human MC4R is an intronless gene (single-exon gene) with an open reading frame of 999 bp. By fluorescent in situ hybridization, the MC4R gene was localized to chromosome 18q21.3 (location: Chromosome 18, NC_000018.9). 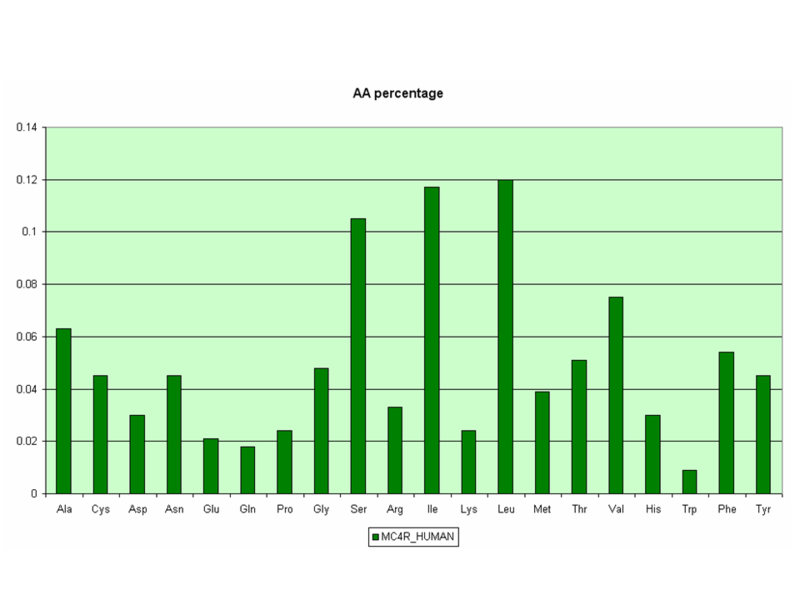 The human MC4R gene encodes for a 332 aa polypeptide. The primary structure of this receptor leads to the formation of a characteristic secondary structure, which defines his specific conformation. The protein is then folded in a tertiary structure that contains different specific domains, which allows interactions with other molecules. 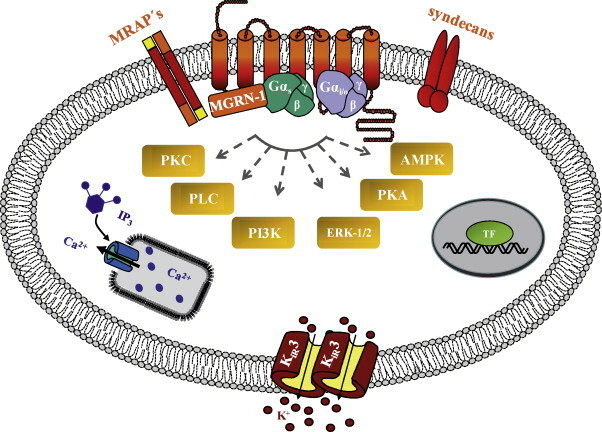 The MC4R is a member of family A GPCRs with seven TMs connected by alternating extracellular loops (ELs) and intracellular loops (ILs). The N terminus is extracellular, and the C terminus is intracellular. Like the other MCRs, it has some unique features compared with other family A GPCRs. In this figure, it is possible to compare human MC1R, MC3R and MC4R with the sequence alignment of bovine rhodopsin (RHO), the highest conserved GPCR family A member. Comparing these MCRs sequences with RHO, this figure underlines the highly conserved disulfide bond linking the top of TM3 and EL2, that is missing in the MC4R, although there is an intraloop disulfide bond in EL3. The intracellular loops and ELs are short, especially EL2, making MC4R one of the shortest members in the GPCR superfamily. Highly conserved Pro in TM5 and Asn in TM7 (in the NPxxY motif, N7.49) in family A GPCRs are substituted by a Met and an Asp, respectively, in the MC4R. The most highly conserved residue in each TM is defined as residue 50, preceded by the helix number. Alignment of MC4R with other MCRs showed that it has the highest homology with the MC3R, with 58% identity and 76% similarity. The amino acid sequences between the different species are highly conserved. For example, there is 93% identity between rat and human MC4Rs and 87% identity between chicken and human MC4Rs. Even the zebrafish and spiny dogfish MC4Rs share 71% identity with hMC4R and more than 90% in the transmembrane domains (TMs). Evolutionary analyses of MC4R sequences from many different species showed that the MC4R has been subject to high levels of continuous purifying selection with codon usage bias, leading to the unusually low levels of silent polymorphisms in humans. Comparing MC4R mRNA with other MCR mRNAs, MC4R seems to have a lower glycine content, but higher levels of valine quantity. In the original cloning article, through Northern blotting of canine mRNAs, it was shown that the MC4R is primarily expressed in brain. By in situ hybridization in mouse brain sections, it was shown that the MC4R mRNA is localized in regions of the thalamus, hypothalamus, and hippocampus. However, while the main tissue in which MC4R is expressed is the brain, it is known that this receptor is also expressed in placental and gut tissues. Following agonist stimulation, MC4R is desensitized by a mechanism that classically includes phosphorylation of the receptor at the C terminus, with recruitment of the clathrin adaptors β-arrestin1 and β-arrestin2. β-Arrestins bind both directly to clathrin and to the clathrin adaptor AP-2, thereby clustering the receptors into clathrin-coated vesicles to be endocytosed. In hypothalamic GT1-7 and human embryonic kidney (HEK) 293 cells, MC4R is desensitized following exposure to the agonist α-MSH. It has been also found that in these cells MC4R is internalized at the same rate in the absence and in the presence of the agonist, indicating that the process is independent of receptor activity. The intracellular traffic of MC4R along the endosomal route appears to play an important role in the function of the receptor. In this respect, prolonged exposure to α-MSH promotes its localization to lysosomes. Agonist-dependent disappearance of MC4R from the cell surface appeared to occur by blocking recycling of a fraction of internalized receptor back to the plasma membrane, rather than by inducing endocytosis. There are four potential N-linked glycosylation sites (three at the N terminus: Asn3, Asn17, and Asn26; and one at EL1: Asn108). Although it is known that the MC4R is glycosylated, there are no reports on the experimental identification of the site(s) that is (are) indeed glycosylated. The exact functions of the glycosylation are also unknown. Two conserved Cys residues at the C terminus, Cys318 and Cys319, might serve as sites for palmitoylation anchoring the C terminus to the plasma membrane, forming a fourth intracellular loop. It is not known whether the MC4R is indeed palmitoylated or where this modification is located. Since the cloning, it has been established that this receptor subtype regulates intracellular concentrations of cyclic 3′,5′-adenosine monophosphate (cAMP) by increasing adenylyl cyclase (AC) activity through Gs proteins and afterwards enhances activity of protein kinase A (PKA). Further, it has been reported that ligand-induced activation of the MC4R modifies the activity of extracellular-regulated kinases, AMP-activated kinase, c-jun kinase, phosphatidylinositol-3-kinase and protein kinase C. Down-stream of these kinases, it has been shown that MC4R signalling regulates ion channel activity, gene expression and enhances insulin signalling by decreasing insulin receptor substrate-1 (IRS-1) phosphorylation. The classical signaling pathway for the MC4R is by coupling to the heterotrimeric stimulatory G protein (Gs). Receptor activation leads to increased cAMP production, and consequently protein kinase A (PKA) activation. In HEK293 cells stably expressing MC4R, MC4R activation was also shown to increase intracellular calcium that was sensitive to cholera toxin. In GT1-1 cells, a mouse hypothalamic cell line expressing MC4R endogenously, it was shown that MC4R can increase intracellular calcium through Gq/phospholipase C-dependent signaling pathway, although in GT1-7 cells (another mouse hypothalamic cell line closely related to GT1-1 cells expressing MC4R endogenously), no increase in intracellular calcium concentrations can be observed. By measuring GTPγS binding, it was shown that the MC4R can also couple to Gi/o proteins. In both heterologous cells expressing WT MC4R and GT1-7 cells, MC4R activation stimulates pertussis toxin-sensitive GTPγS binding, implicating coupling to Gi/o proteins. Interestingly, AgRP also stimulates GTPγS binding, suggesting that it can decrease cAMP levels by both antagonizing Gs activation and stimulating Gi/o activation. The physiological relevance of these signaling pathways has not been investigated in detail. In summary, MC4R can couple to all three major classes of G proteins, Gs, Gi/o, and Gq, changing second messengers such as cAMP and calcium and activating MAPK including ERK1/2 and JNK. MC4R expression in the PVH nucleus of hypothalamus is critical for food intake regulation, since reintroduction of MC4R in the PVH of the conditional Mc4r-mouse was sufﬁcient to reverse the hyperphagia normally observed in this mouse model. Signalling molecules that mediate the effect of MC4R on food intake are beginning to be identiﬁed, and they are summarized in the following image. Moreover, Mc4r-null mice gain more weight compared with wild-type mice when given the same amount of food as a result of their lower energy expenditure. Although the neuroanatomical sites critical for MC4R-mediated energy expenditure in mice have not yet been identiﬁed, it is known that MC4R regulation of energy expenditure is mediated through activation of the sympathetic nervous system involving sites in the hypothalamus and brainstem. 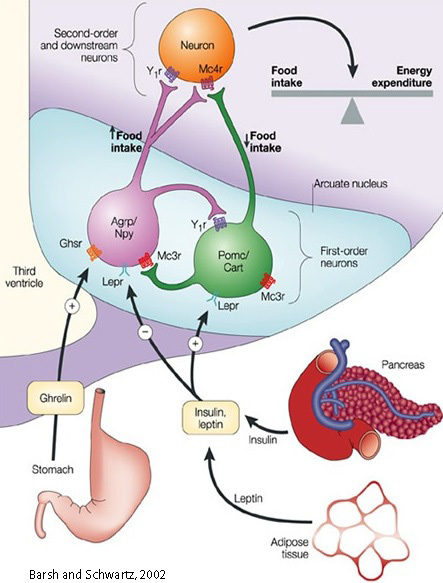 Moreover, the neuronal endocrine secreted peptide precursor called VGF may function in melanocortin regulated sympathetic projections to WAT that control lipolysis, (The role of the vgf gene and VGF-derived peptides in nutrition and metabolism, 2007) and melanocortin regulated sympathetic projections to pancreas and liver. that control glucose homoeostasis. Given the fact that MC4R signaling enhances anorexigenic effects (appetite suppressing), the regulation of its signaling has been recently well studied in order to find candidate anorexigenic molecules. Given the fact that this receptor is activated by POMC-derived melanocortins, most of studies have focused on activators of POMC neurons in hypothalamic arcuate nucleus (ARC). In particular, these neurons are activated by two main circulating hormones: insulin, produced by pancreas, and leptin, secreted by adipocytes. These hormones circulate at levels proportionate to body fat content and enters the brain, where they intagrate informations about the metabolic state of the organism and regulate energy balance. However, when administred orally, these hormones are not able to significantly reduce food intake or increase energy expenditure. However, several hormones released from the gut in response to food intake exert anorexigenic responses in the brain, particularly in the hypothalamus. These hormones include glucagon-like peptide-1 (GLP-1), cholecystokinin (CCK), peptide tyrosine tyrosine (PYY), pancreatic polypeptide (PP), and oxyntomodulin (OXM or OXY). Of note, it has been recently found that orally administered GLP-1 and PYY3-36 have a marked effect on appetite by showing enhanced fullness at meal onset and reduced energy intake. The importance of MC4R signalling in the regulation of human metabolism has been highlighted by the finding that mutations in the MC4R gene are the most frequent monogenic cause of severe obesity. Accordingly, targeted disruption of the MC4R or the POMC gene in mice causes an obesity-diabetes syndrome characterized by hyperphagia, hyperinsulinemia and hyperglycemia. In 1998, the groups of Froguel and O’Rahilly independently reported the first frameshift mutations in the MC4R gene associated with severe early-onset obesity. Since then, more than 150 distinct mutations have been identified from patient cohorts of different ethnic origins. These mutations include at least 122 missense mutations, two inframe deletion mutations, and seven nonsense mutations, as well as dozens of frameshift mutations. From this figure, it is very clear that these mutations are scattered throughout the MC4R. A total of at least 105 residues are mutated, representing 32% of the receptor. The prevalence of MC4R mutations appears to vary depending on the ethnic origin, severity of obesity, and age of obesity onset. Up to 6% of early-onset morbidly obese patients in British Caucasians were found to have MC4R mutations. In other studies, lower prevalence was found: 0% in morbidly obese Belgian children and adults, 1.9% in obese German children and adolescents, 1.8% in obese Finnish children, 1.7% in obese European Caucasians, 4.6% in Pima Indians, and 2.3% in North American severely obese adults. Lower prevalence is observed in Asian and Mediterranean populations. Although there are some subjects homozygous for MC4R mutations, the vast majority of the subjects are heterozygous. Moreover, children with decreased MC4R signaling, despite normal weight loss after lifestyle intervention, have much greater difficulty in maintaining weight loss. Patients homozygous for MC4R mutations are more severely obese than patients heterozygous for MC4R mutations. Interestingly, several studies suggested that the MC4R is a double-edged sword that can either cause obesity or protect from obesity. Two MC4R polymorphisms, V103I and I251L, have been shown to confer resistance to obesity. In summary, several studies unequivocally demonstrated that the MC4R is a critical regulator of energy homeostasis in humans. Mutations in the MC4R are the most common monogenic form of human obesity. To catalog the numerous MC4R mutations, it has been proposed a classification scheme. This scheme is based on the life cycle of the receptor and modeled after the classification of mutations in low-density lipoprotein receptor and cystic fibrosis transmembrane conductance regulator. Class I: null mutations. Due to defective protein synthesis and/or accelerated protein degradation, receptor protein levels are decreased. Class II: intracellularly retained mutants. The mutant receptors are produced but are retained intracellularly, most likely in the endoplasmic reticulum due to misfolding being detected by the cell’s quality control system. This class comprises the largest set of MC4R mutations reported to date. Class III: binding defective mutants. These mutants are expressed on the cell surface but are defective in ligand binding per se, with decreased binding capacity and/or affinity. Class IV: signaling-defective mutants. These mutant MC4Rs are transported to the cell surface, bind ligand, but are defective in agonist-stimulated signaling with decreased efficacy and/or potency. Class V: variants with unknown defect. These variants have normal cell surface expression, ligand binding, and signaling (basal and ligand-stimulated). Whether and how these variants cause energy imbalance and therefore obesity is unclear. The functional properties of new variant MC4Rs identified in obese subjects have to be analyzed to more accurately determine whether the phenotype of the variant is indeed consistent with the clinical phenotype and to devise strategies for personalized medicine. Class I mutants, due to nonsense mutations, for example can potentially be corrected by aminoglycoside antibiotics by decreasing the codon-anticodon fidelity, resulting in read-through of the premature stop codon. Synthetic ligands[1%2C4]diazepine-5%2C7-dione%2C+a+novel+7-TM+receptor+ligand+core+structure+with+melanocortin+receptor+agonist+activity can be also tested for their abilities to correct class III and IV mutants, those mutants that are expressed on the cell surface but could not bind the endogenous ligands or respond to these ligands. Some of these synthetic ligands might bind to residues different from endogenous ligands and therefore activate some of the mutant receptors. Indeed, some synthetic MC4R ligands can stimulate various MC4R mutants that are impaired in responding to endogenous ligands. Because class II mutants are most numerous, it could be interesting to test whether small molecule ligands that can pass the plasma and endoplasmic reticulum membranes might act as pharmacological chaperones correcting the folding defect of the mutant receptors. Given the fact that some of the MC4R mutants have residual signaling activity, approaches that result in their increased expression on the cell surface could potentially be of therapeutic value. Numerous laboratories, especially those in pharmaceutical companies, performed extensive studies trying to discover novel small molecule ligands for the MC4R. Although preclinical trials have shown that some of these MC4R compounds are effective, they have not reached clinical use yet. Side effects, including nausea, yawning and stretching, sexual arousal and penile erections, as well as cardiovascular complications such as hypertension, are partly to blame. Additional considerations are selectivity for the MC4R and tachyphylaxis. It has been pointed out that the MC4R can ameliorate other comorbidities such as lipid and glucose dyshomeostasis, in addition to the treatment of obesity, therefore offering great potential in treating metabolic syndrome. Further research in this rapidly expanding field offers great promise.